Razer is pushing out a new firmware update to its gaming-centric Razer Phone. The phone’s display, which is already quite popular for its 120Hz refresh rate, will now be able to take full advantage of the phone’s HDR10 capabilities for streaming Netflix. 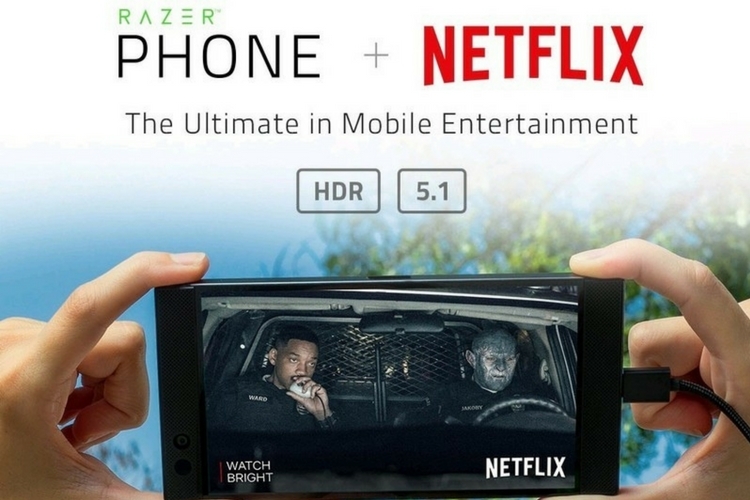 The firmware update weighing 249MB brings HDR for Netflix through a new customized Netflix application for the Razer Phone. This new Netflix app called Netflix HDR is baked right into the ROM itself. With this update, what we are looking at is a world’s only phone with Netflix HDR, a 120Hz display and arguably the best stereo speakers on a smartphone. Can’t get better than that, can it? Well, in addition to Netflix HDR, the update also enables Dolby Digital 5.1 on the phone’s dual loudspeakers for supported content. Plus, on the Android side of things, the update will bring the phone up to the latest Android security patch for January 2017. Also as a part of Razer’s commitment to improving the overall camera experience on the Razer Phone, the update also brings some camera improvements. And lastly for what its worth, the update also adds a theme store. That being said, the Razer Phone is still running on Android 7.1.1; however, the company is committed to delivering 8.0 this quarter. Also, the update is currently rolling out in stages and hence you may not receive it right away.